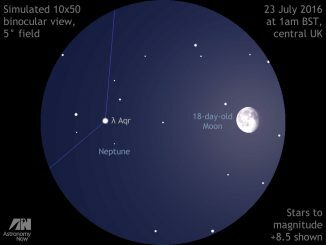 Novice observers wishing to see outermost planet Neptune with small telescopes often have difficulty locating it, not because it’s excessively faint — slightly brighter than magnitude +8, so 10×50 binoculars will reveal it under dark, moonless skies — but due to its star-like appearance. Higher magnifications will reveal its pale blue 2.2-arcsecond disc, distinguishing it from background stars of similar brightness. 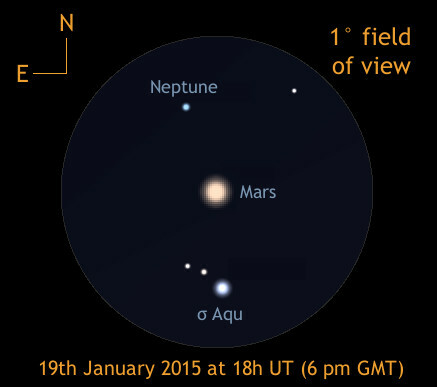 However, a very convenient celestial marker in the form of a close conjunction with planetary sibling Mars makes locating Neptune very easy in a telescope on Monday, 19th January. 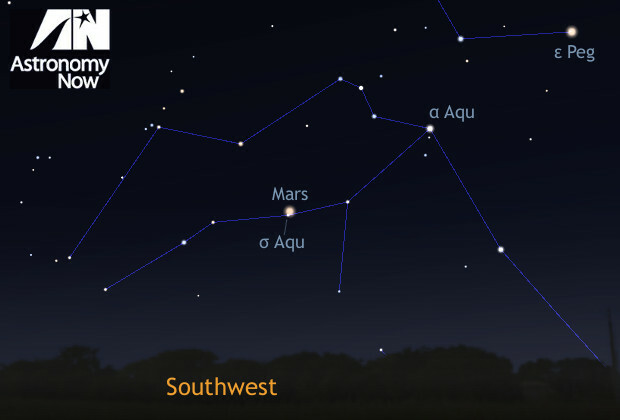 Set against the constellation backdrop of Aquarius low to the southwest at the time of their closest approach — which is, of course, a line of sight effect — Mars will be 2.06 astronomical units (191 million miles; 307 million km.) distant and displaying a tiny 4.6-arcsecond gibbous disc, while Neptune is a colossal 30.75 AU (2859 million miles) away! 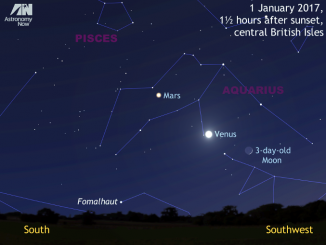 Observers in the British Isles should have their binoculars or telescopes setup facing an unobscured southwest horizon by 5:30 pm GMT as twilight fades enough for the stars to be visible. As you observe this planetary juxtaposition with an angular separation of just ¼° in the eyepiece, contemplate the contrast in physical makeup of these two worlds — Mars is rocky and more Earth-like though half the size of our planet, while Neptune is gaseous and four times the size of Earth. For an even greater image contrast, brilliant Venus also passes just ¾° away from Neptune on the evening of February 1st. More on that next month. Although Jupiter close to opposition may be stealing the other naked-eye planets’ thunder, there’s lots more to see if you’re an early riser on the weekend of 5–6 May. 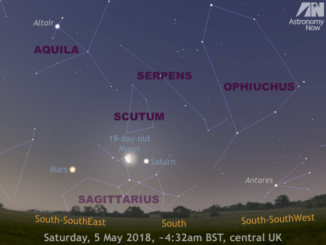 About an hour before sunrise finds Mars and Saturn less than the span of an outstretched hand at arm’s length apart in the UK southern sky, with the waning gibbous Moon acting as a convenient guide to each planet on successive mornings. Outermost planet Neptune reaches opposition on 2 September 2016, this year marking the 170th anniversary of the gas giant’s discovery. But you don’t have to wait six week to observe the farthest known planet of the solar system, because the waning gibbous Moon drops close by in the small hours of Saturday, 23 July as seen from the British Isles.